I have been playing the violin and piano since 1996, and whilst at University, mastered the viola and cello. 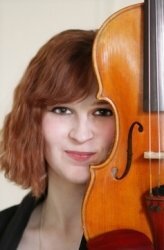 Currently also working for Kingston Music Service as violin tutor (as of October 2017) providing one to one lessons with pupils, and also as a classroom violin tutor in the Wider Opportunities Scheme. Whilst at University, I formed a string quartet which went on to perform at University Graduations, a function for the Mayor of Kingston, fashion shows, weddings and anniversaries and business functions. We have also collaborated with several bands including Emmy's Unicorn and TALA. Through this, the quartet has performed onstage in many venues including 'New Slang', at the Hippodrome, Kingston, live on BBC Radio Wales, at the Dublin Castle, and many more. Quartet is still together now, and are enjoying performing together for any and every occasion. Whilst at University, I was awarded 'Highly Commended' in 2011 in the Concerto Competition. I lead the University's Orchestra for over two years, and enjoyed running separate string section rehearsals. I have expanded my solo performance repertoire on both the violin and piano and have enjoyed exploring new styles. I have performed in several music videos and recorded backing tracks on both the violin and viola. Working as Deputy Room Leader and Music Coordinator within a nursery setting has given me valuable experience in planning music sessions for a variety of standards and children's personalities. I am looking forward to beginning work with Juma Music as Music Tutor in nurseries and play centres within Surrey. I am performing to Diploma standard on the violin and above grade 8 on both viola and piano. I also enjoy singing and playing the guitar. Working at a Diploma level on violin, above ABRSM Grade 8 viola and piano, and ABRSM Grade 7 Theory. Graduated from Kingston University with a BMus Music majoring in Performance (2:1 with honours), Completed an ABRSM course on teaching. Experience working as a Special Needs Assistant in a primary school, having completed all of the necessary training including Positive Touch. I have been teaching since 2009. I aim to to motivate and inspire all age groups and involve the student in a fun dynamic lesson. I love teaching and enjoy it thoroughly, which is shown in my pupil's progress and achievements. I currently work within a nursery setting as Music Coordinator where I am to run music classes for each age group developing each child's musical abilities alongside the EYFS framework. I can teach in group lessons, one-to-one, and parent and child lessons. I am currently looking to tutor small group lessons for preschool aged children. Please contact me for more information. I am to plan each pupil's lesson to suit their individual needs whilst sourcing suitable music. My aim is to provide a fun, yet educational lesson in a relaxed environment, taking students through their ABRSM Examinations if desired and have had a 100% pass rate. I teach all standards from beginner to experienced through a range of ages from 5 years old to mature adults. I am also experienced in tutoring group music classes for babies aged 18 months to 5 years, working alongside the EYFS. MorganFrom Daniel (5/5): Paulina enjoys her lessons very much, and I am happy how pleased she is with Morgan. Morgan is a kind, patient tutor who very much loves music and teaching. MorganFrom Brigid (5/5): I totally recommend Morgan as she has just given me my first lesson. She is very professional and has a lovely manner which put me at my ease as I was slightly anxious. She immediately understood how I should proceed and make progress and I am looking forward to learning more from her next week. MorganFrom John (5/5): Morgan was really helpful in finding a workable slot for my daughter's lessons. She immediately engaged my daughter and she has a new found excitement towards the piano, the lessons have gone so well that we have added music theory to them too. MorganFrom Gianluca (5/5): I was looking for a piano tutor who could travel to our home or living nearby. I was hoping that we could find convenient arrangements with Morgan but unfortunately her place is a bit far from where we live to take the children. I am sure that Morgan is an excellent tutor but we could not find a suitable agreement. MorganFrom Jane (5/5): I have been having piano lessons with Morgan for a little while and recently sat my grade 5 exam with her. She has given me the motivation I needed to get playing again after a 20 year break. Fantastic! Reply from: Morgan: Thanks! Fingers crossed for the results! MorganFrom Thomas (5/5): Absolutely fantastic tutor. Really helps you understand the basics and develop your skills further. Super friendly and easy to get along with. HIGHLY RECOMMENDED! Reply from: Morgan: Thanks, Tom! MorganFrom Nick (5/5): Poppy is enjoying her practice with Morgan - result!